How’s this for money well spent? For just $8 this weekend, you can score tickets to one of Chicago’s hottest shows and get a nice buzz going, too. Details, you say? 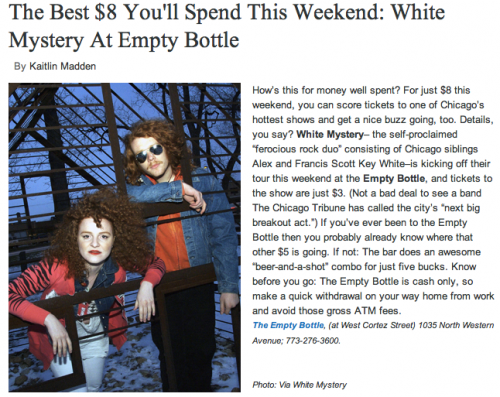 White Mystery– the self-proclaimed “ferocious rock duo” consisting of Chicago siblings Alex and Francis Scott Key White–is kicking off their tour this weekend at the Empty Bottle, and tickets to the show are just $3. (Not a bad deal to see a band The Chicago Tribune has called the city’s “next big breakout act.”) If you’ve ever been to the Empty Bottle then you probably already know where that other $5 is going. If not: The bar does an awesome “beer-and-a-shot” combo for just five bucks. Know before you go: The Empty Bottle is cash only, so make a quick withdrawal on your way home from work and avoid those gross ATM fees. The Empty Bottle, (at West Cortez Street) 1035 North Western Avenue; 773-276-3600.